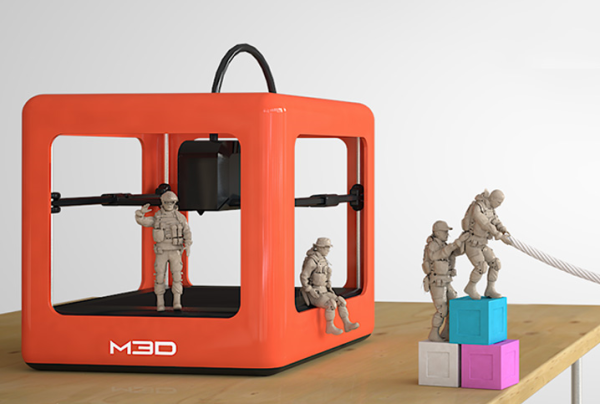 New Kickstarter project brings the price of 3D printing down-to-earth for the first time ever. I’ve been a little (OK a lot) fascinated with consumer-grade 3D printing ever since I saw my first MakerBot device in the flesh at the Consumer Electronics Show back in 2010. The MakerBot booth was surrounded by onlookers on a nearly constant basis and not because the company had employed scantily –clad women to attract the milling masses. They didn’t need to. They had something way better than a booth babe: a new technology that let people create virtually any 3D object from scratch. Show attendees huddled around small wooden boxes that looked like they’d been made from spare TinkerToy parts, while a robotic mechanism jumped and jerked around, slowly producing a 3D object, layer by layer. It was mesmerizing. Back then, three things were true of consumer 3D printing. 1) It was expensive. Even MakerBot’s original Thing-o-Matic (the device that kickstarted the 3D craze even before Kickstarter had its first hit project) had a starting price of well over $1,000 and it was the least expensive model on the planet. 2) The examples of what you could make were limited to what you could download from a 3D library or design yourself using 3D software. And 3) it wasn’t exactly consumer-friendly. Calibration was regularly required and the software was not the easiest to master.